The KaVo 647B High-speed Fiberoptic Handpiece features a large, powerful turbine with triple-port spray cooling. The handpiece is indicated for clinical procedures requiring a significant amount of heavy cutting such as crown and bridge. The 647B is connected to the dental unit handpiece hose by either the KaVo Multiflex Lux 465 LRN or the Kavo Multiflex Lux 1390 Coupler (NOT INCLUDED). Both couplers provide easy handpiece interchangeability, anti-retraction valves and 360° swivel. The Multiflex Lux 465 LRN Coupler contains the fiberoptic bulb and water spray adjustment and is used with Kavo LCM illuminators and tubing (6-pin type). The Kavo Multiflex Lux 1390 Coupler allows the handpiece to be connected to standard ISO 5-hole fiberoptic handpiece hoses that provide the fiberoptic light with a bulb at the end of the hose or from a remote source. The handpiece has a push-button autochuck and can be heat sterilized in either an autoclave or chemiclave. The KaVo 647B handpiece (including coupler NOT INCLUDED) measures 14 cm (5.5 inches) in length and weighs 91 grams (3.2 ounces). 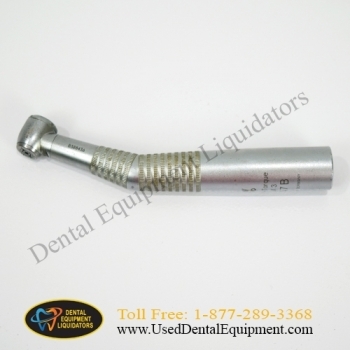 The handpiece head is 12.5 mm (0.5 inches) in diameter and 14.6 mm (0.57 inches) long. The distance from the back of the handpiece head to the tip of a standard 19-mm bur (i.e.,interocclusal clearance) is 22.7 mm (0.9 inches).